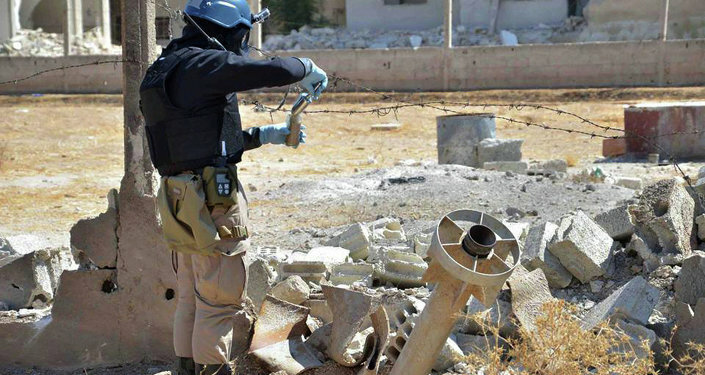 Despite being repeatedly accused of using chemical weapons, Damascus has strongly denied having them; it destroyed its arsenal several years ago, and their complete destruction was subsequently confirmed by the Organization for the Prohibition of Chemical Weapons (OPCW). French President Emmanuel Macron, who had previously threatened to respond immediately to any use of chemical weapons in Syria, once again made it clear that France would launch strikes if the fact that the Syrian government had used weapons of mass destruction (WMD) against its civilians was proven. "We will strike the place where these launches are made or where they are organized. But today our services have not established proof that the prescribed chemical weapons have been used against civilian populations. As soon as such proof is established, I will do what I said," Macron told France’s presidential press corps. 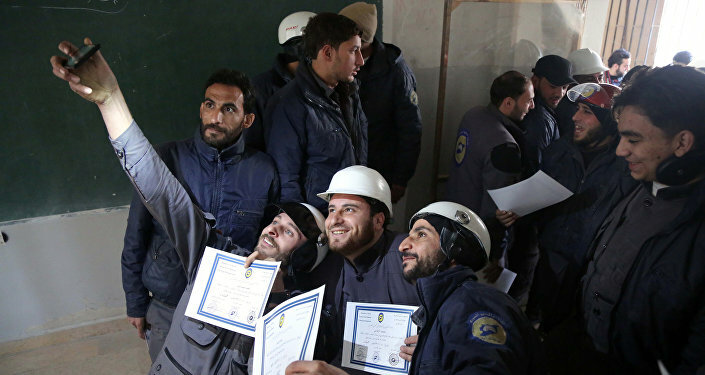 Earlier this week, the Russian Center for Syrian Reconciliation received information from a local resident in a village in Idlib that Tahrir al-Sham (formerly known as Jabhat al-Nusra) terrorists and White Helmets, the so-called Syrian Civil Defense, were preparing to stage a provocation involving the use of chemical weapons and blame it on Damascus. "On the evening of February 12, the Russian Center for Reconciliation received a telephone call from a resident of a settlement in Idlib province, informing about a forthcoming provocation, using poisonous chemicals, and intentions to air it on a foreign television channel. According to the person, on the afternoon of February 12, the al-Nusra Front militants delivered more than 20 bottles of chlorine and personal protective equipment in three cars," the Russian military stated. "At the moment because we don't know what happened and the consequences of what happened; we can't say we are where you say we are. We have some indications of the use of chlorine, but we do not have absolute confirmation, so it is this confirmation work that we are doing with others because obviously, we have to establish the facts," she said. On April 4, 2017, the National Coalition for Syrian Revolutionary and Opposition Forces, backed by the United States, blamed Damascus for the Khan Sheikhoun incident that took place in Idlib province. Western governments accused Bashar Assad of being responsible for the use of sarin gas, an allegation he has repeatedly denied, reiterating that Syria did not possess a chemical weapons arsenal, the full destruction of which was confirmed by the Organization for the Prohibition of Chemical Weapons (OPCW). Reacting to the incident, the United States, having no proof of the use of chemical weapons by Damascus, launched 59 Tomahawk cruise missiles at the Syria-government airfield in Ash Sha’irat on April 7.